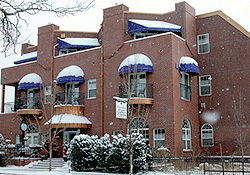 Welcome to The Old Town GuestHouse Bed and Breakfast Inn located in the "heartbeat of Colorado Springs" and Old Town. 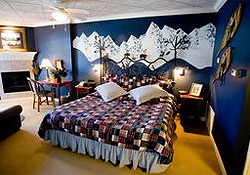 The Old Town GuestHouse Bed and Breakfast Inn caters to adults for leisure and also gives corporate rates to business travelers. Off-street parking and virtually soundproof rooms are found here. 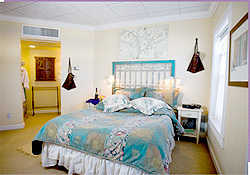 We are smoke free and we offer special guest room that are disabled friendly. Our elevator makes all rooms fully accessible. Old Town GuestHouse Bed and Breakfast Inn has a private Conference Center that accommodates over 40 persons and is equipped to offer videoconferencing. Our videoconferencing site networks to provide national and international communication and is available 24 hours a day , 7 days a week. 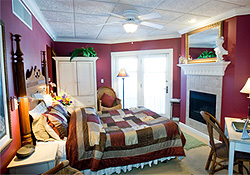 Old Town GuestHouse Bed and Breakfast Inn is AAA approved. We look forward to your visit.